For the second game of the doubleheader, Dave Freisleben took the mound and he had a new batterymate that day. The Padres’ backup catcher, Bob Barton, had broken his finger and would miss the rest of the season. The Padres swung a deal with the Astros on August 1 and brought back a familiar face to Padres fans in Chris Cannizarro. Cannizarro was the Padres’ first All-Star in 1969 and had his career-best season with the Padres in 1970. With Fred Kendall catching the first game, it would be up to Cannizarro to guide rookie Freisleben against a Reds team that featured Pete Rose, Joe Morgan, Johnny Bench, Tony Perez, and Ken Griffey Sr.
Clay Kirby settled in and was pitching a great game himself. The Padres managed to get two runners to second base during the same period of time, but couldn’t manage to drive in a run off their former ace. So heading into the eighth inning, the score was tied 0-0. The Kid had pitched a great game, but his old number 43 was still on the mound for San Diego, pitching a greater game shutting down the Big Red Machine. The Reds looked like they were finally going to score off Freisleben in the 11th. Pete Rose hit a one-out double and the Padres intentionally walked Joe Morgan to pitch to Bill Plummer, who had replaced Johnny Bench earlier in the game. Freisleben struck out Plummer and got Tony Perez to fly out to Cito Gaston in right to end the threat. His friend Rusty Gerhardt came on in the fourteenth and struck out Tony Perez looking, Darrel Chaney swinging, and retired Dave Concepcion on a fly to center fielder Dave Winfield. The Padres offense finally came to life off of Pedro Bourbon. Nate Colbert doubled, and Dave Winfield was intentionally walked. Cito Gaston grounded out to short to move the runners over. Dave Roberts was intentionally walked and Fred Kendall (who replaced Cannizarro to start the top of the fourteenth) hit a sacrifice fly that scored Nate Colbert from third. That was it: Padres 1, Reds 0. Rusty Gerhardt earned his first major league win while Pedro Borbon suffered the loss. 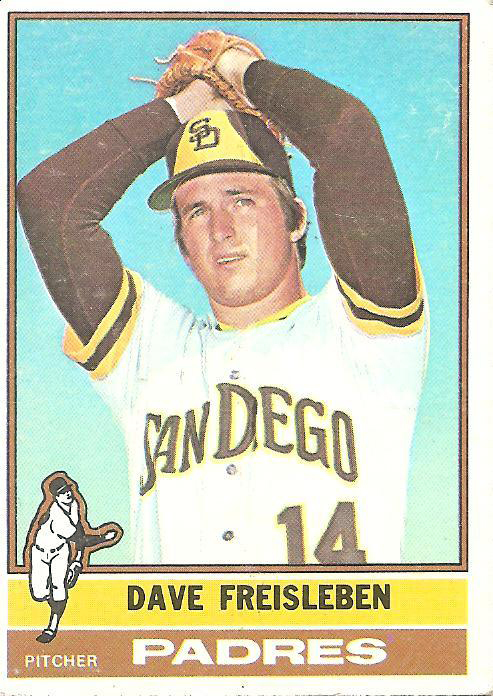 Pitching for perennially weak teams in San Diego and later in Cleveland and Toronto, Dave Freisleben concluded his career with a record of 34-60 and a 4.30 ERA. His rookie year was probably his best as he managed a 9-14 slate with a 3.66 ERA and a career-high 130 strikeouts. On August 4, 1974, he had the day in the sun that every player dreams of. 1 Phil Collier, “Padres win in 14th 1-0 to gain split with Reds,” San Diego Union Tribune, August 5, 1974, C-1. 4 Interview with Dave Freisleben, March 6, 2014.